Primefaces provides cool rendering facilities on one hand. Minuteproject provides reverse-engineering facilities base on relational database but also on sql statement, on the other hand. Now you have a query and you want to have a primefaces app!... without writing any (ANY) line of code. If you download Minuteproject 0.8.2+ you can have an example on how-to do it (delivered as a demo). This article tracks the steps to follow as well as explaining the demo. 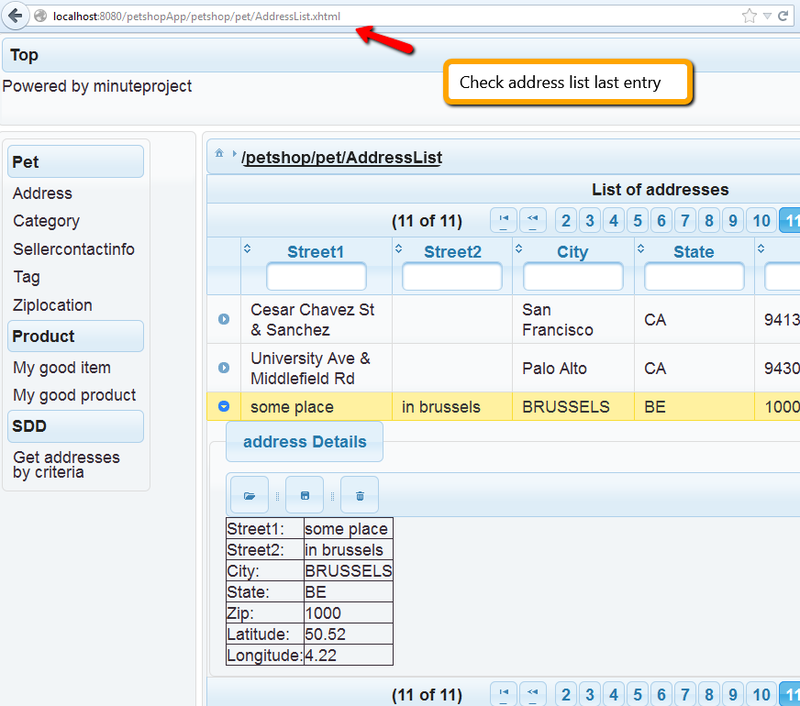 Minuteproject provides a enrichment area where you can set up your sql queries. Here is the snippet part correspondinng to the query enrichment inside the statement-model node. Primefaces needs to have new templates about what to generate coming from SDD. Download last version of Minuteproject. Run all demos and package. 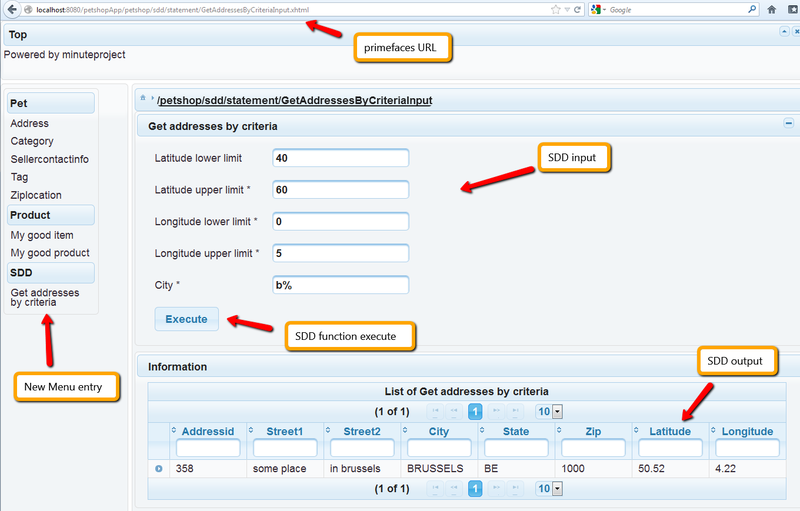 You have a JSF primeface 3.3 app with cupertino theme offering Create, List, Delete on entities and with I/O screen of each query here (GetAddressesByCriteriaInput). You have Spring 3 integration with CRUD DAO on top of entity and DAO for SDD query DTOs. This way you can easily work with minuteproject Updatable Code feature to get what you customize your artifact without losing the power of consecutive generations. It is ready to be dropped on tomcat or other JEE container. But before take care that your EL (expression language jar spec and impl) are 2.2. Note: that there is no connection pool dependency on the container. By default in nothing is specified in the JPA2 target 'environment' property. The environment is considered has local so no reference to a JNDI CP. Here is a little UC where we create an address and we retrieve it base on the ad-hoc sdd query. Why not having multiple statement that works together to produce for example a master-detail or dashboard-master-detail?... 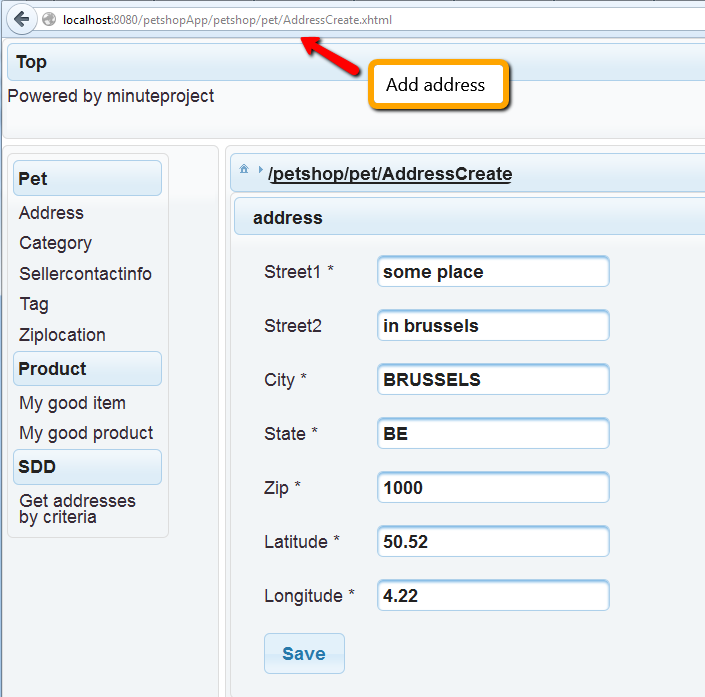 primefaces provides nice toolset for that. SDD in the current form is sql oriented, but nothing prevent from having it REST URL resource oriented. Add validations, mapping, convertions on I/O params. You have to mention your previous job names as well as organization names in your resume.